The holidays can be a fun, joyful time to spend with friends and family. Unfortunately, for people with anxiety, they can also cause symptoms to flare up. Learning how to deal with holiday stress can help when it comes to managing those anxiety symptoms. Almost everyone experiences some stress during the holidays. Schedules are busier than usual. Between parties and family events, shopping, cooking, etc., it’s easy to feel overwhelmed. But, that doesn’t mean your anxiety symptoms need to get out of control. When you can better manage holiday stress, you can actually enjoy these events, rather than worry about them. Realistically, it is not possible to get through life avoiding every single one of your anxiety triggers all the time. The same is true for the holiday season. But that doesn’t mean you have to openly invite those triggers into your life again and again. It’s okay to say “no” to some things! If you’re feeling anxious about too many parties, consider declining some invitations. If you feel like you’re being pushed to your limits, take a step back. Most people are understanding when it comes to those limits and will respect them. Even if you do feel obligated to do something, like attend a party, don’t force yourself to stay the whole time. Popping in for an hour or so can fulfill that obligation without causing you extra stress. If you struggle with anxiety, having a support system year-round is important. But it can be especially effective during the holidays. And when you’re starting to feel like the season is becoming too much, don’t be afraid to lean on those people for guidance and help. Even if you don’t already have a strong support system in place, it’s okay! Think about a family member or friend who has always been able to calm your nerves or make you feel better. It’s a good idea to talk to that person about the holiday stress you’re feeling. That way, you can ask them to be there for you if your anxiety symptoms start to become too much to handle. Holiday parties and family gatherings can often leave you with a lot of things you can’t control. From who is on the guest list to what type of food will be served—there are simply some things you’ll have to deal with. So, try not to stress over those things that are out of your control. Worrying about things you can’t control at holiday gatherings will only cause your anxiety symptoms to become worse. Instead, try to focus on the bigger picture of each get-together. Or distract yourself. For example, ask the host if you can help with dinner or other errands. Distracting yourself from triggers that are out of your hands will make your symptoms easier to manage. 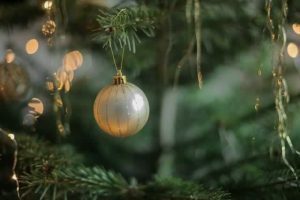 Even with anxiety, there are undoubtedly plenty of aspects about the holidays you enjoy. Maybe it’s a quiet moment in the evening with a cup of cocoa. Maybe it’s looking at holiday decorations. Try to focus on those moments, rather than getting caught up in the things that cause you stress. It might sound corny to focus on the positives, but, in doing so, you may actually have an easier time getting through the things that trigger your anxiety. Take care of yourself throughout the holiday season. That’s truly the best thing you can do. If you’re still struggling or you’re worried about how you’ll feel this season, please contact us to learn more about how anxiety therapy may be able to help you. Together, we can go over even more management tips for your anxiety. When you feel confident about how to manage your anxiety symptoms, the holiday stress becomes easier to handle.